Currently the workspace's pretty name is passed as description by mistake. 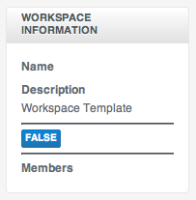 Also, since the template is now a workspace, the "JOIN" label in the workspace panel is displaying "FALSE" instead (because the membership type object is not initialized for the template). This can be fixed in the install script, where the template is initialized.